The lighting design challenge for this open office plan was the low ceilings, sprawling and varied cluster of work and meeting spaces, and irregular and oversized columns. The lighting goal was to generate unity from clutter. To create a single bold gesture, both architectural and a nod to the companies corporate branding, that molded volumes that don’t exist, created harmony with the interior design, and to get the users excited about light. 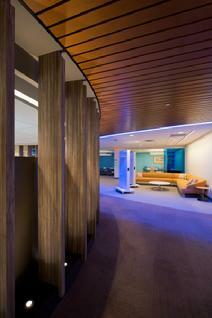 The lighting design broke rules about circulation, redefined office lighting, and created a playful work environment. The curving luminous lines mark a transitional border between a light colored ceiling and dark flooring, creating the illusion of volume. The curving lines are white and blue. Their glow is created from frosted LED strip concealed within an open curving cavity. Perceived volumes flow between circulation and meeting spaces, and the sense of volume is enhanced by the play of dark and light interior surfaces. The curving lines flow above desks and pass over seating areas. Downlights in the wood ceiling supplement the illumination between the luminous lines. Within the core of the open area is an open pantry. The pantry is separated by wood fins and up lit from concealed light in their base. The circular line surrounding the pantry creates the illusion of an island. A linear ceiling light illuminates the eating table.